2012 super heavyweight gold medalist Anthony Joshua is in Austria sparring with IBF/IBO/WBA/WBO heavyweight champion Wladimir Klitschko (62-3, 52 KOs) to get him ready for his fight next month against unbeaten #1 IBF Kubrat Pulev (20-0, 11 KOs) at the O2 World Arena in Hamburg, Germany. 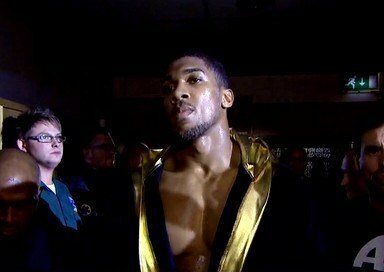 Joshua will be at the Klitschko camp for 10 days of sparring, which should help both fighters improve. This is great for Joshua because he gets to improve his game while at the same time seeing how far apart he is with Wladimir in terms of talent. The 6’6” Joshua’s job is to try and get Wladimir ready for what he’ll be facing when he gets in the ring with the 6’4 ½” Pulev on 9/6. Joshua is a little a little taller than Pulev with better overall punching power and hand speed. The thing that sets them apart right now is Pulev’s excellent jab. Joshua can’t mimic the jab that Pulev has, because he’s got a jab that is more of a power punch than a normal jab. Pulev is lighter on his feet than Joshua, and he tends to back away quickly when he feels that an opponent will be coming at him to land some shots. Wladimir may end up seeing a drop off in talent when he gets in the ring with Pulev compared to his sparring with Joshua, because the British heavyweight is capable of doing many more things than the 33-year-old Pulev. There’s quite a gulf in hand speed, power and natural talent with Joshua compared to Pulev.